My10MinuteBlog: Will we starve after Brexit ? Among the worst of the Brexit scare stories to have emerged is the prospect that we will be no longer be able to import or export food across the channel. Is this true ? If so, what can be done to mitigate this ? 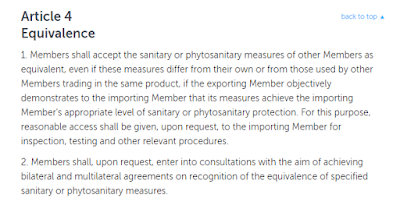 - Live animals and animal products must be imported via a nominated Border Inspection Post (BIP) where specific veterinary controls are undertaken to prevent transmission of human and animal diseases ( the frequency of physical checks of consignments is governed by Commission Decision 94/360/EC ). - Certain plants and plant products must have a phytosanitary certificate, guaranteeing they have been properly inspected; are free from harmful organisms ; and conform with relevant plant health regulations. (governed by Directive 2000/29/EC ). The requirement for checks on live animal and animal products, particularly meat products, will create serious capacity issues at BIPs and cause long delays - hence the risk to the food supply chain. Since the UK is copying EU law into UK law as part of the Great Repeal Bill, EU imports to the UK will also be subject to third country checks. The flow of trade will be impacted in both directions. - Animal products from EFTA EEA states and Switzerland do not require veterinary checks (page 19). 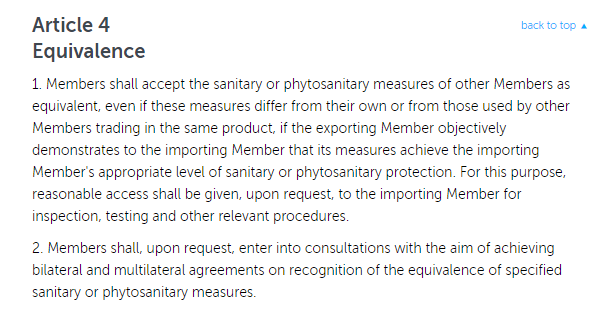 The EFTA EEA states adopt EU Sanitary & Phyto-Sanitary (SPS) regulations, i.e. animal & plant health regulations, by virtue of regulatory harmonisation mandated by the EEA agreement. Switzerland has largely adapted its SPS regulations to the EU's. Effectively, the EFTA EEA states and Switzerland form part of an extended EU SPS regulatory regime, and have border inspection posts which are part of the external border of the EU (see Swiss Border Veterinary Service web page). Other third countries who do not have harmonised SPS regulations in the manner of EFTA EEA or Switzerland, can still have equivalence agreements with the EU - where their regimes are deemed of sufficient standard to warrant lower rates of checks and/or mutual recognition of certificates. Chile has agreements covering both animal products and plant products. However, it should be noted that the EU's SPS regulations are highly restrictive and protectionist - effectively you have to conform fully to EU regulations to trade freely. Canada has found that barriers to agricultural trade with the EU still exist, despite having an equivalence agreement built into CETA. The EU's regulatory regime is a major reason (along with the EU's Rules of Origin) why developing economies in Africa and the Commonwealth find it so hard to export agricultural goods profitably to the EU. So in the first instance, the UK will probably want to follow something like the Swiss model via an equivalence agreement with the EU (which only requires Qualified Majority Voting approval by EU, not unanimity). The UK will start from a position of 100% harmonisation and the same inspection regime that is currently recognised within the EU. If regulatory convergence is maintained, there is no good reason to impose border inspections. The UK should ensure an equivalence agreement provides reciprocity - inspections are waived in both directions or not at all. In the medium to long-term, the UK will face a choice - it can reduce barriers to agricultural trade with the Rest of the World but only at the cost of encountering barriers to agricultural trade with the EU. The UK may well choose to diverge on regulations and pivot to trade beyond the EU (although problems for agricultural business operating across the Irish border should be noted), at which point UK-EU agricultural trade would begin to operate less like the Swiss model and operate more like other third countries. Checks may be introduced for given sectors and the rate of checks may increase depending on the regulatory divergence. - harm its own agricultural sector (the UK imports 3 times more agricultural products than it exports to the EU). It is also worth noting that Commission Decision 94/360/EC provides for "a reduction in the frequency of physical checks of consignments of products imported from third countries should be fixed on the basis of the criteria laid down in Article 8 (3) of Directive 90/675/EEC on experiences in the Member States and the danger to public and animal health in the Community". In other words the UK and EU can decide that each other's products are still safe at the point of Brexit and do not warrant an immediate imposition of a high levels of checks. Now I don't have a high opinion of the EU. But those who push this food scare story are suggesting the EU really are mad and bad. If so, why would we want to stay in the EU (as Remainers want) or under EU regulatory control in the EEA (as Flexciteers want) ? Beats me.